Toy Gun Office Simulator is Live!!! I’m really jazzed to finally launch Toy Gun Office Simulator on Steam! Currently I’m working on an update to fix a handful of bugs and add a few new features. I may add Steam Achievements and different types of guns in a future update. Anywho, it’s really exciting to have Toy Gun Office Simulator in the wild! Aside from myself, I’m the only person within my family and group of friends that owns a VR Headset. This is more than a little concerning when I plan on releasing a VR Game that I want people to actually play. 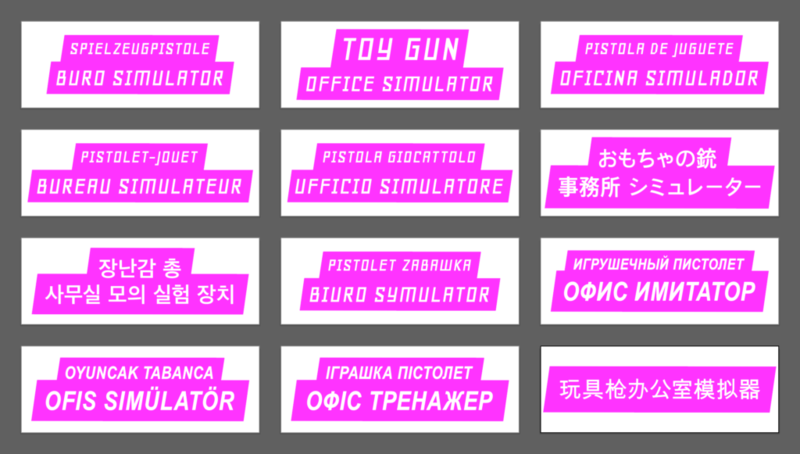 To get around this issue I’ve been localizing Toy Gun Office Simulator in order to make it playable by as many folks as possible. For its initial launch on Steam it should be translated into Chinese, English, French, German, Italian, Japanese, Korean, Polish, Russian, Spanish, Turkish, and Ukrainian. I’m using I2 Localization in Unity which at least makes the coding part of this relatively painless. Although it has been interesting working through the design challenges involved in this effort and I’m hoping that it makes a difference in how accessible the game is. Starting the Steam Submission Process! Toy Gun Office Simulator is an action VR shooter where you test your mettle in four unique, atmospheric levels. Improve your sharpshooter abilities and survive as many waves of targets as your can! I’d like to have Toy Gun Office Simulator released by the end of August — which nearly meets the “have one game self-published within a year” goal I had about a year ago when I setup Wanana, LLC. Over the last couple of months I’ve been working on the game’s look-and-feel, menus, and target practice level. I feel like the game’s come quite a long way and will hopefully be in beta soon. These screenshots don’t really do the colors justice. It’s a neon nightmare with a VR Headset on. I’m going for a low-poly, early video game aesthetic to the AR layer of the game so I’m really happy with how gross and retro it is. Updated the design of the VR game and added rag doll skeletons. It’s been a productive morning! Over the last couple of months I’ve been busy prototyping several shooting levels for a potential VR Game. They’re all extremely rough but I’m quite happy with most of them and am planning on expanding them into a full-on, actual game. Some of my favorite prototypes are a whack-a-mole style shooter, dodging asteroids as you’re shooting them apart, and defending against waves of humanoid attackers. As you can see in the screenshots, the prototypes all take place within an office environment. 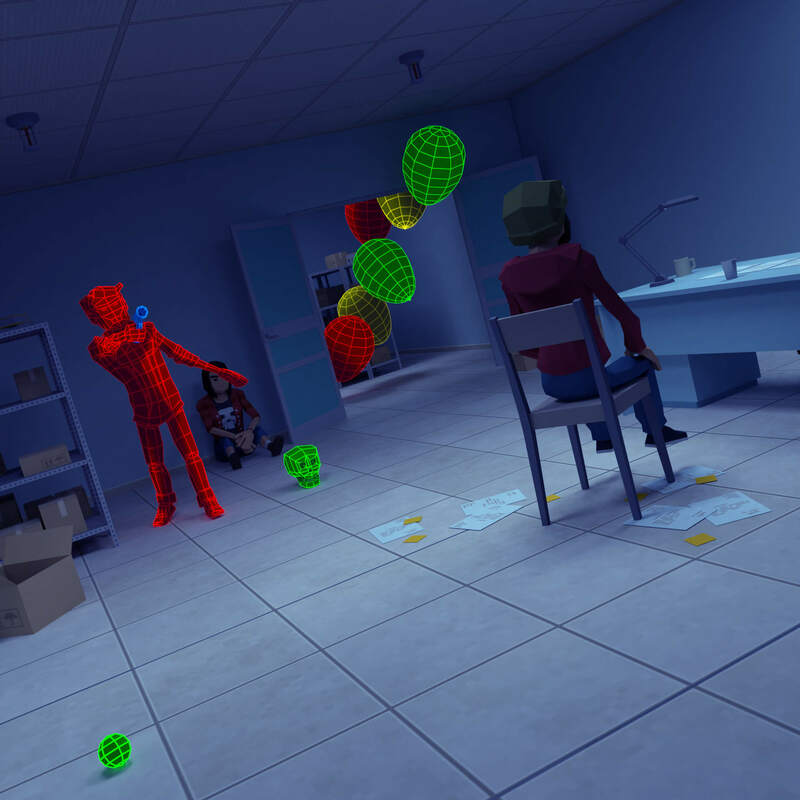 I like the idea of a video game existing within augmented reality, with your co-workers unaware of what you’re actually doing, so I think that’s the direction I’ll be going in for now. This office/AR concept also lends itself to a lot of interesting juxtapositioning of things. Like deers grazing beside a water cooler, vikings attacking around a conference table, or space ships flying past the building’s receptionist.